The yacht club was very friendly and had helped us with our check in but the best thing was that they had not 1 but 4 front loading, 1200 rpm washing machines with HOT water. I was in heaven, if it wasn’t nailed down it was washed while we were there. Sunday 14th August was a good day with us making an early start and walking around the Emerald crated on Petit Terre, the little island. 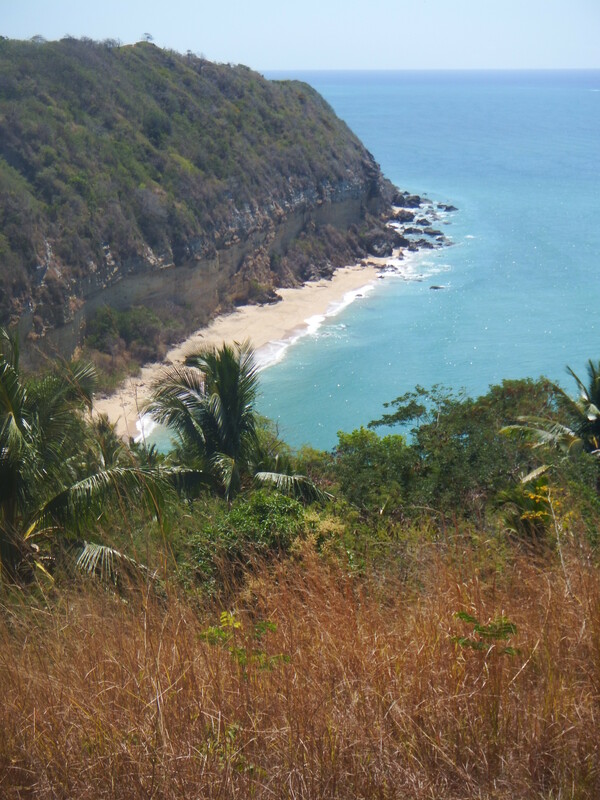 We walked right round the ridge along the top and down to the beaches on the other side. I’ll just post some photos for you to enjoy. A nice panoramic shot showing the ridge path on both sides. Before we completed the circuit a path leads south towards the beach. 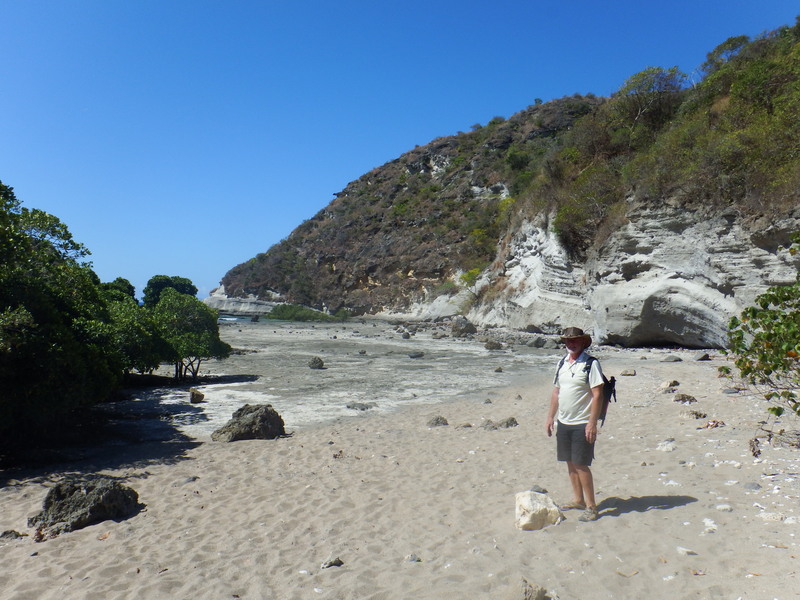 This is the beach on the outside of the crater rim but we couldn’t get down to it. Someone had thoughtfully built a picnic hut at the top. 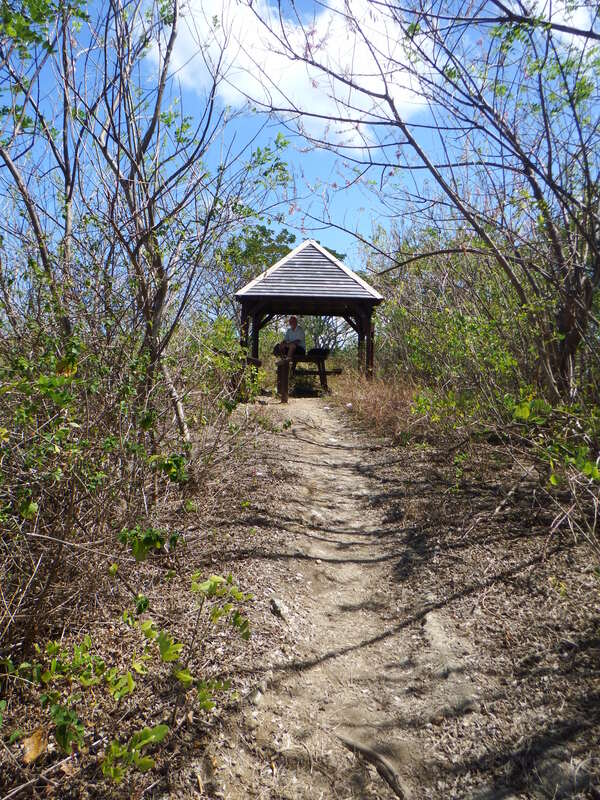 The path continued towards two vent bubbles that have created two beaches. To get down to the beach it’s an almost vertical track and my knees I didn’t fancy it so we continued passed the beaches to the road and walked back to the beach. 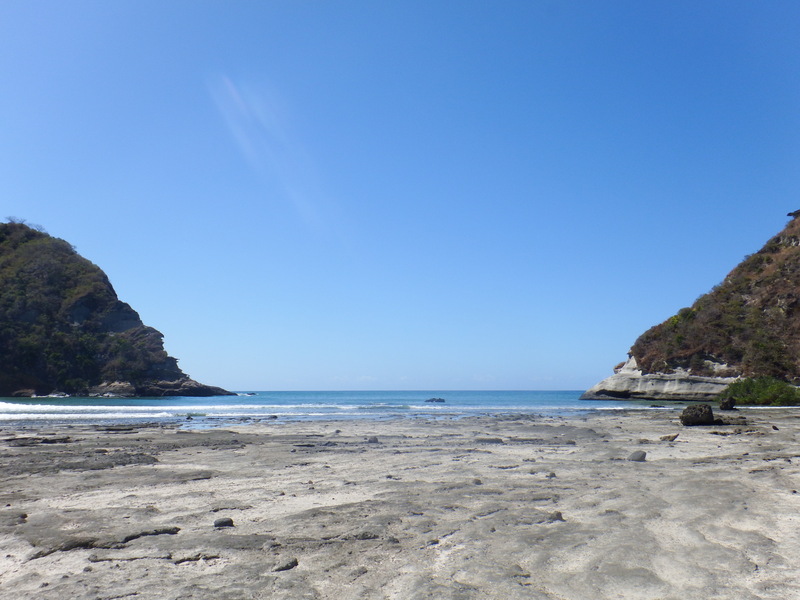 The beaches were volcanic black sand mixed with some light sand giving it a grey colour but very hot to walk on. The northern beach was mostly hard rock formed from the flowing lava many thousands of years ago. 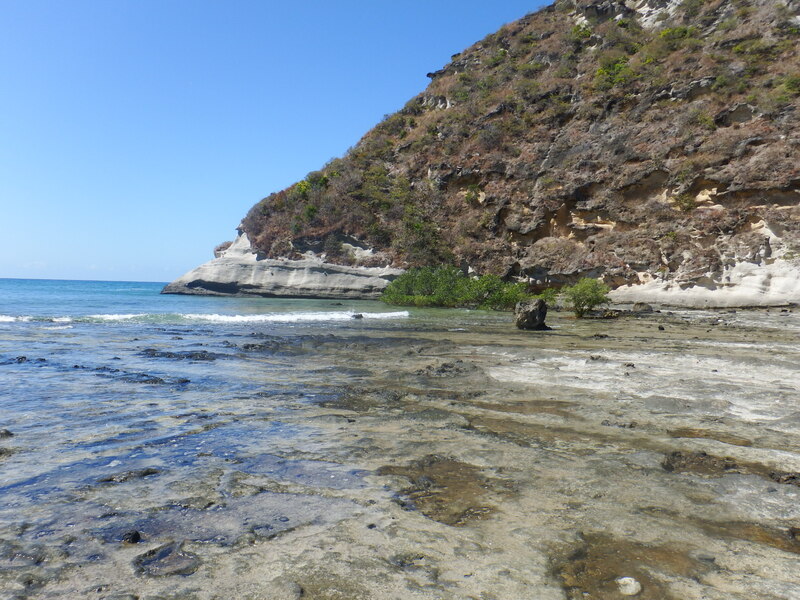 Higher up the beach there was sand but also mangrove trees growing in the edge of the water. The rock by Bill’s feet was a piece of solid marble. See the layers in the rock behind him. 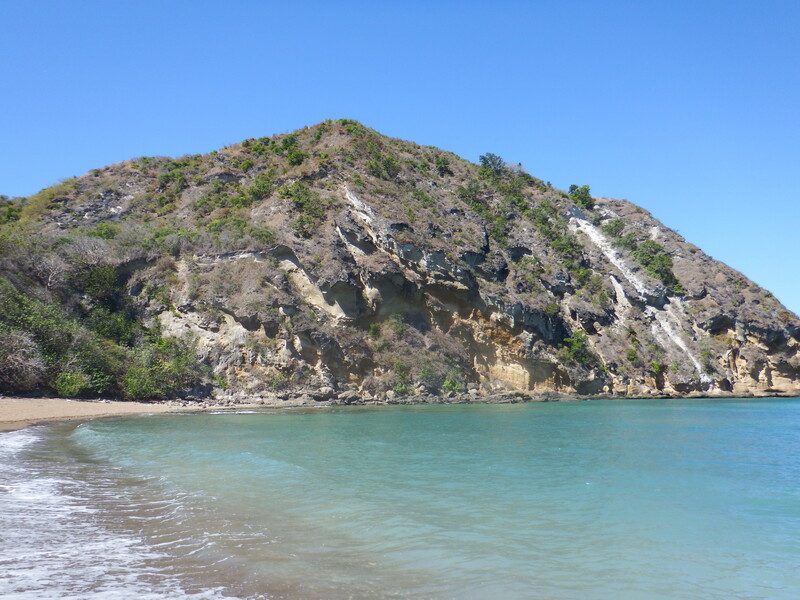 The north wall of the southern beach with stalactites dripping from the overhangs. 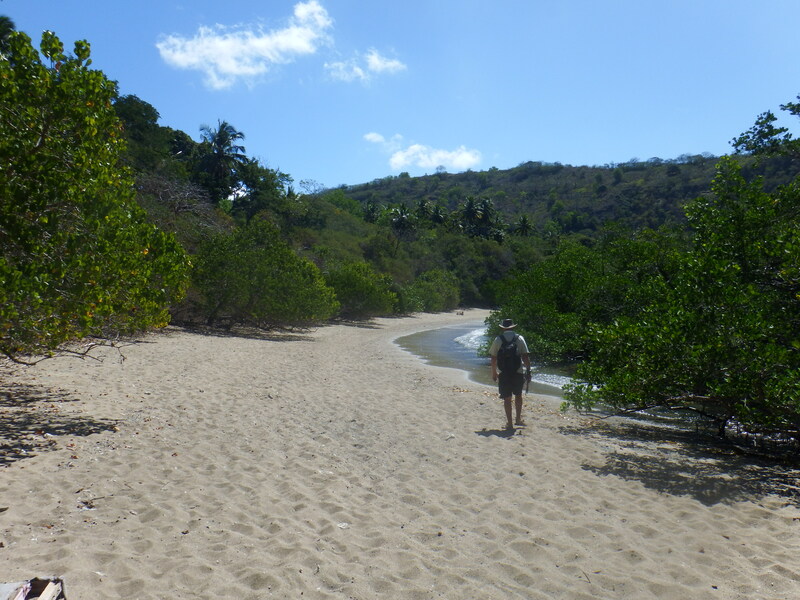 The southern beach was more sandy and had many turtle tracks up the beach where turtles lay their eggs at night. The sea looked very inviting after our sweaty walk but we didn’t have our swimmers with us. After walking back up to the car park we were lucky enough to get a taxi back to the dinghy jetty. We spent part of our second week looking for an emergency dentist because I had toothache which was getting worse and worse. 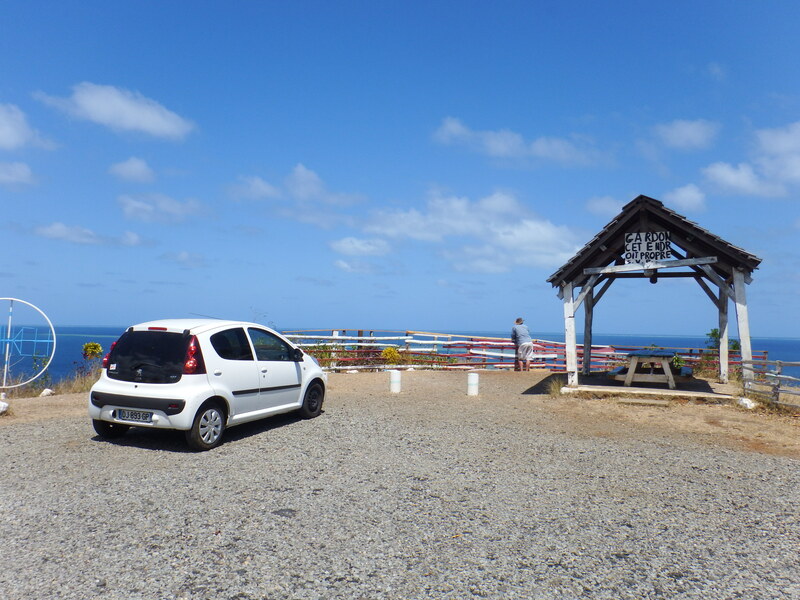 Fortunately by Thursday I was sorted with a temporary filling so on Friday we hired a car for the day to look around the island. There were some nice views from some of the headlands. 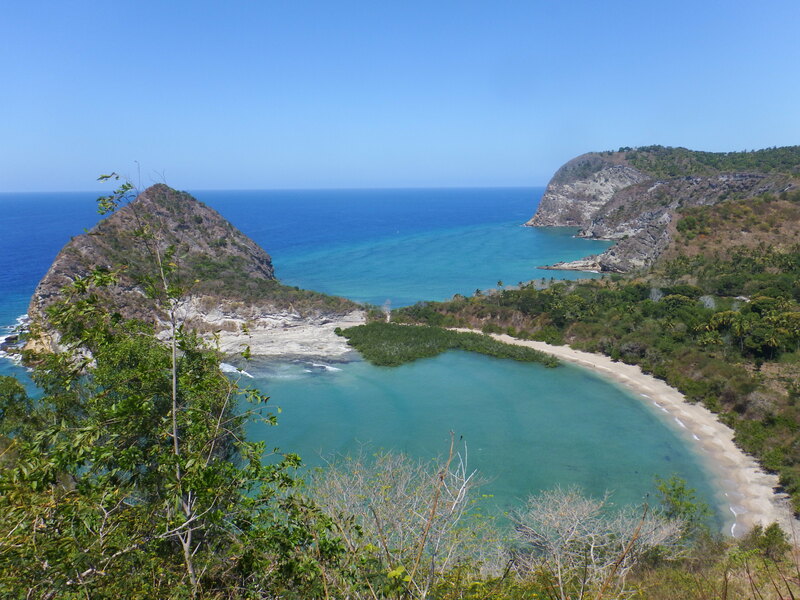 The botanical gardens weren’t very good and sadly there was a lot of rubbish strew around the island as well as a lot of ‘dead’ cars but we did find some nice beaches. 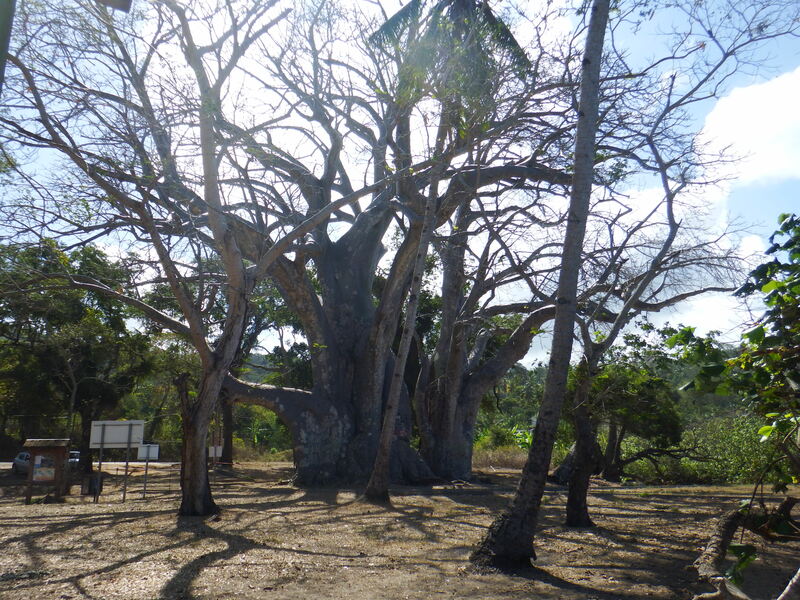 Mayotte has some species of the Baobab trees growing next to some of the beaches. 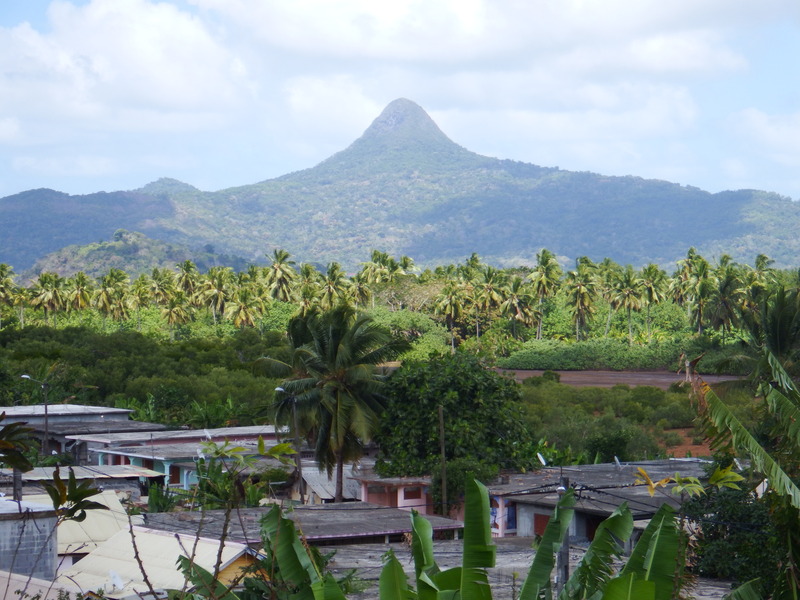 The island is dominated by Mlima Benara the highest peak on Grande-Terra. 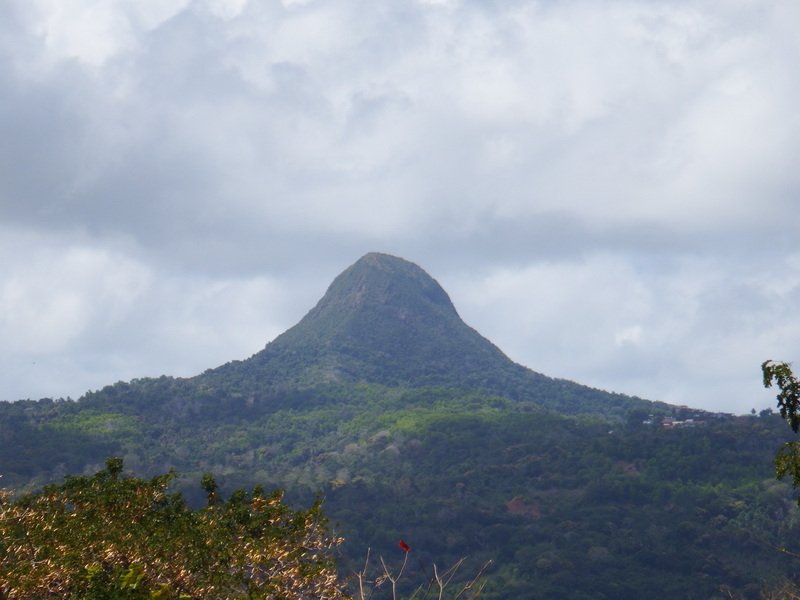 It’s distinct shape is visible from almost any where on the island. 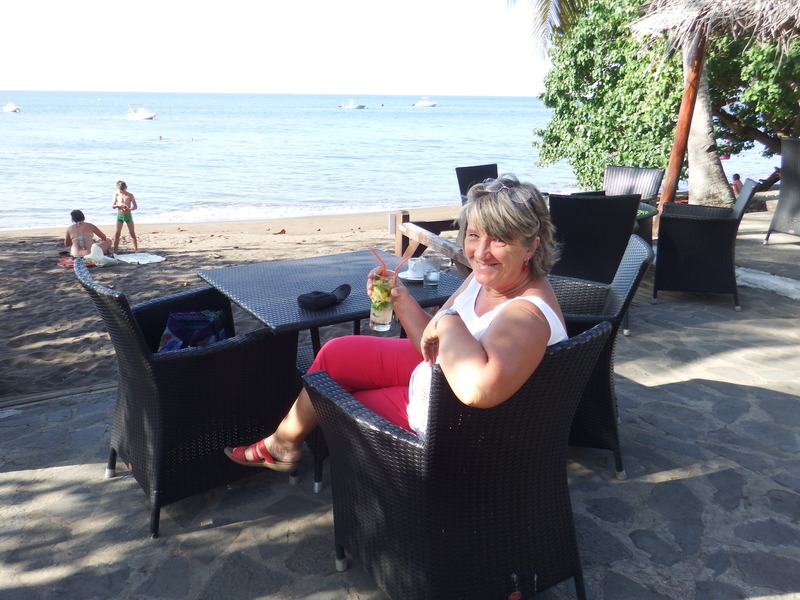 Our last stop was at a nice hotel that had tables on the beach for a mojito. Monday 22nd I went to the dentist again to have the root removed and the tooth filled. 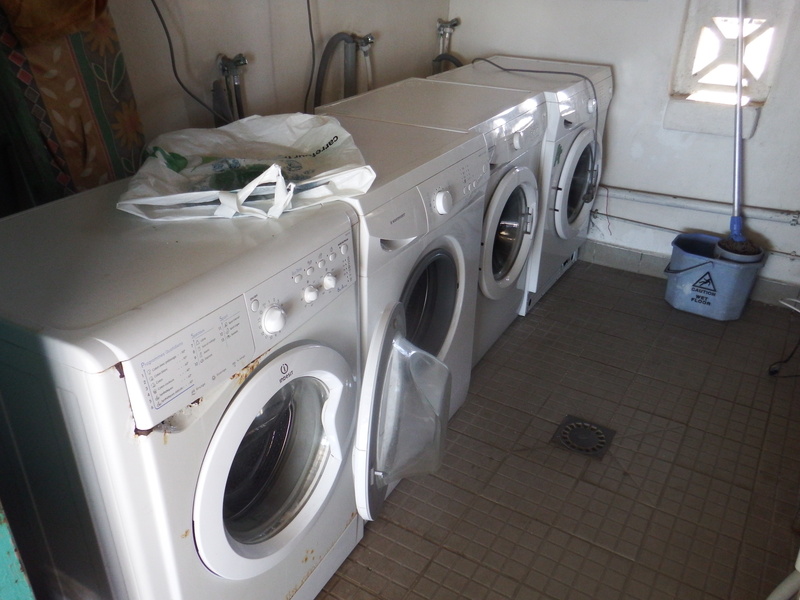 I was very worried although I shouldn’t have been because all was OK. We went ahead and checked out Tuesday, after a last batch of washing and shopping, and left Mayotte first thing Wednesday morning. 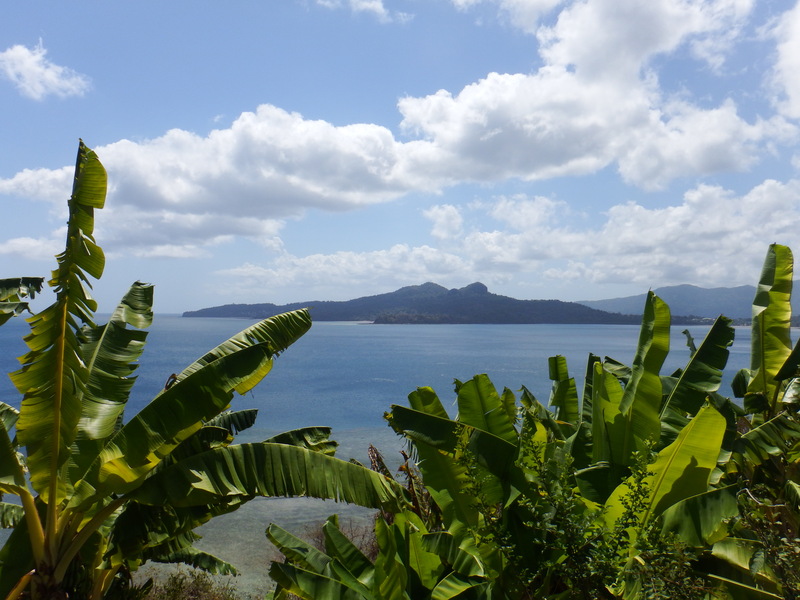 I can’t honestly recommend Mayotte, a week would have been long enough, although we found the people were friendly and I got my tooth sorted. 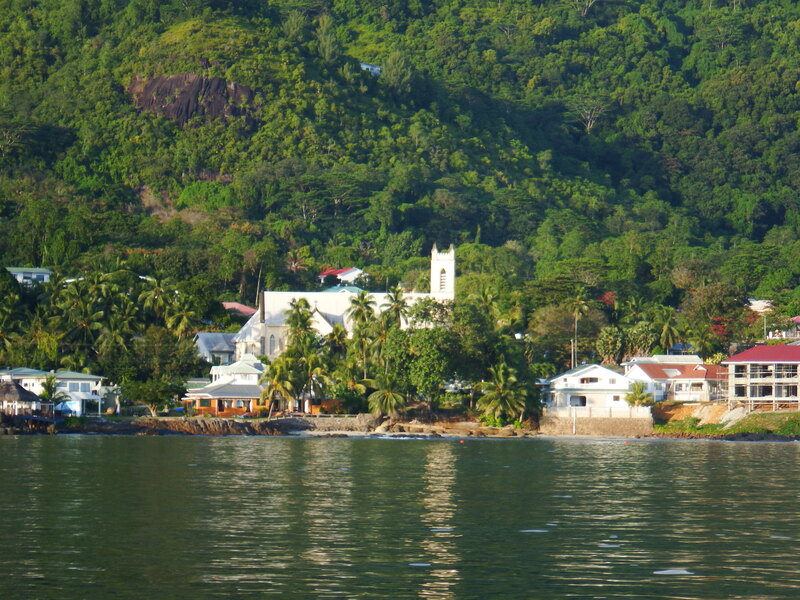 The main reason for going there was to avoid the Seychelles to Madagascar run, which has a notorious reputation. 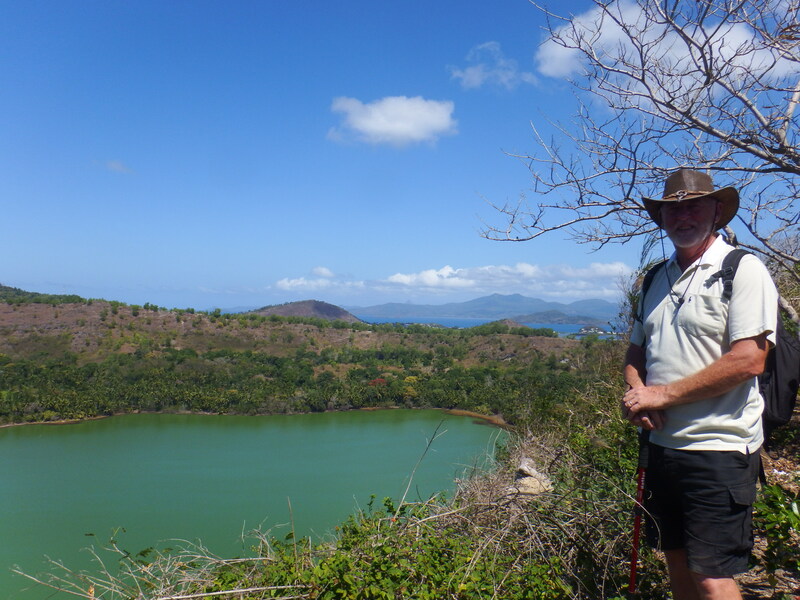 Instead our trip from Mayotte to Madagascar was an easy one. 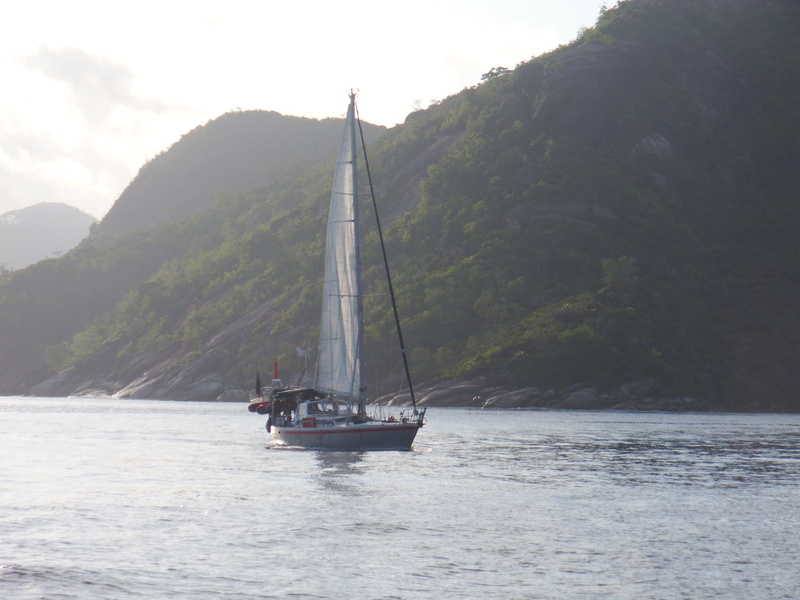 We exited out of the Bandrelle pass on the south east corner of the reef at 08.00 with Tintin and Elonisa. There was a light wind so we were able to start off sailing. By 15.30 the wind had dropped and we had to motor overnight. This amazing sunset was seen in the evening. 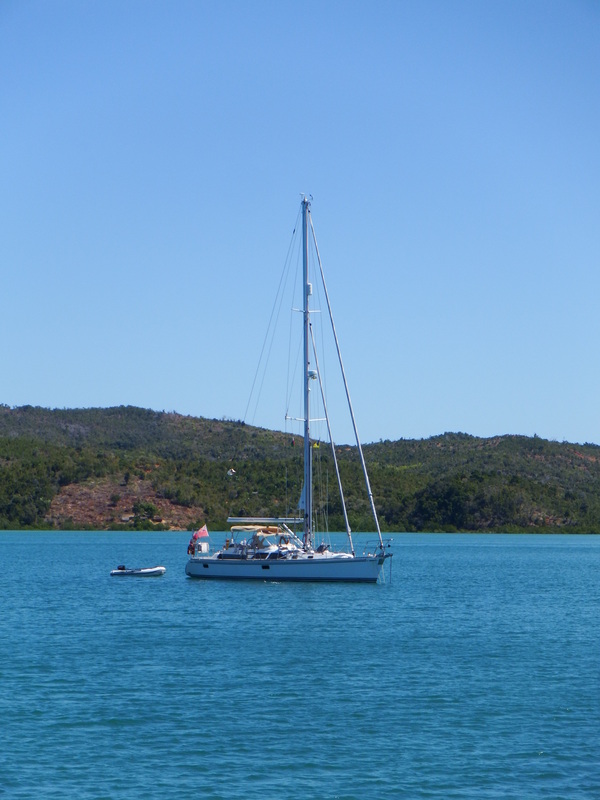 We continued motoring the next day until about 14.30 when the sea breeze from Madagascar started up and the engine was turned off again. We sailed the last three hours. Although Elonisa had gone on ahead of us being a much bigger and faster boat Camomile arrived just 10 minutes after Tintin again. The journey of 188 miles took 36 hours making it an average of 5.2 kph. 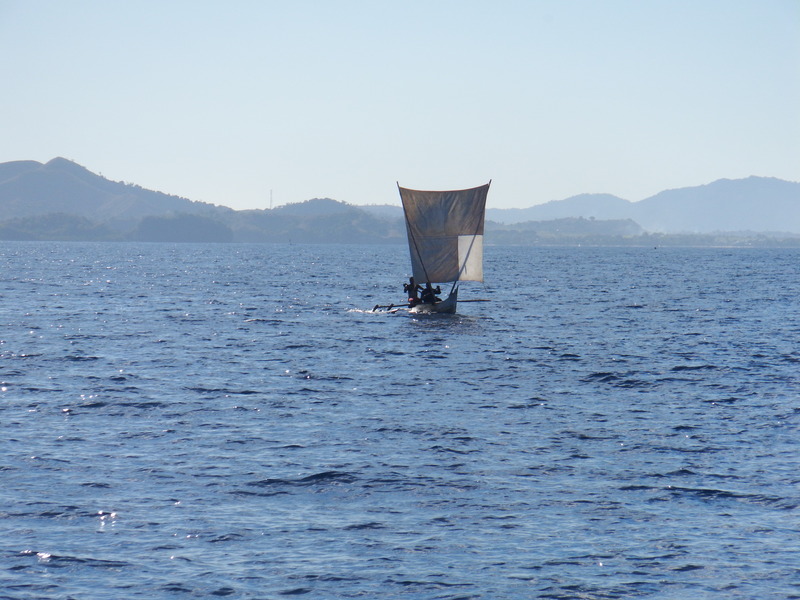 In the morning we enjoyed seeing these wonderful pirogues using the last of the land breeze to sail out to their fishing ground and in the afternoon they use the sea breeze to sail back again. They are a magnificent sight but some of the sails are very worn out. Even the little canoes have a sail of sorts on to use the wind. These guys were also paddling hard. 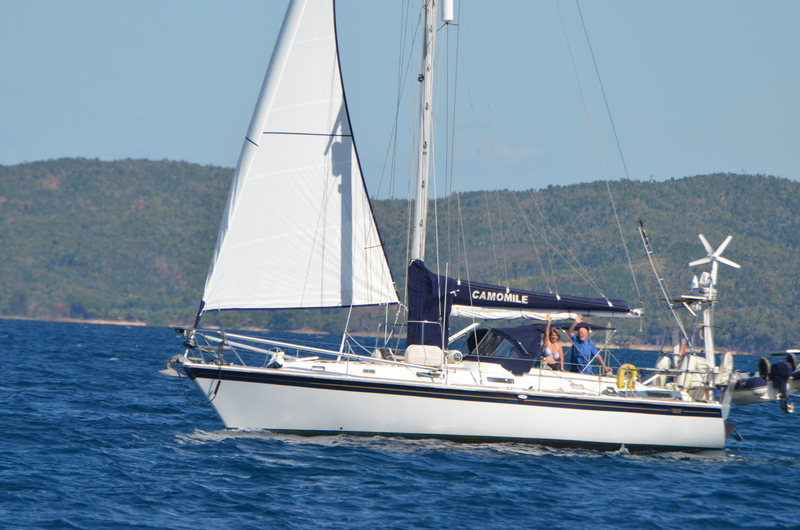 For those yachties following along behind us, if you get new sails for your Indian ocean trip don’t through your old sails away. Bring them here, they would make very good use of them. The next morning Tintin headed into Hellville but we didn’t want to check in until Monday morning so we motored across the bay to Nosy Kisimany to meet up with Tom and Susie on Adina. Beautiful approach. 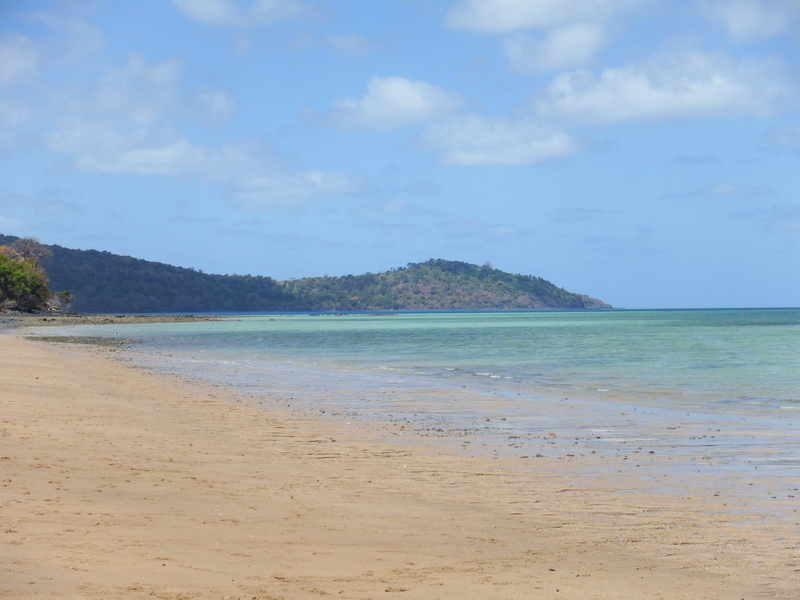 First impressions of Madagascar are good. One of the things that’s so striking is the lack of rubbish every where. That’s mainly because the plastic age hasn’t fully reached these parts yet – long may it continue. This wonderful canoe followed us into the anchorage on the way to his village. 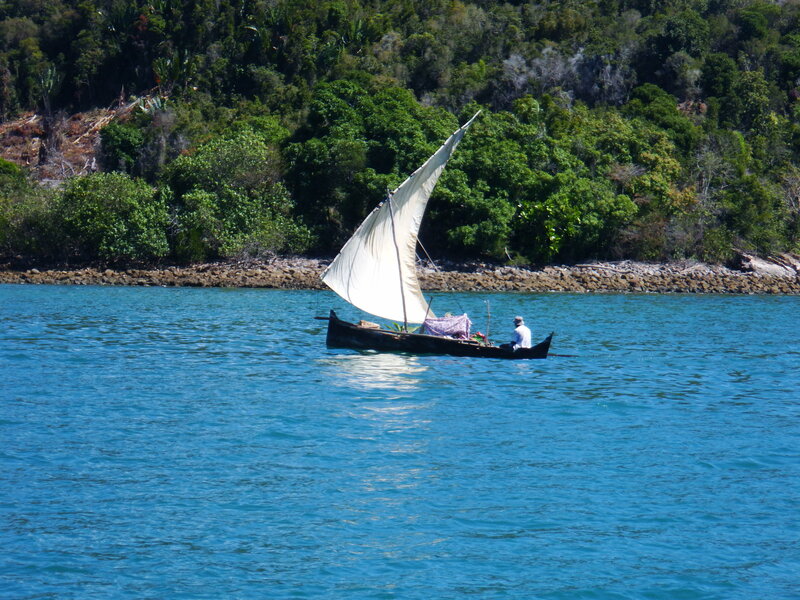 Again using his sail – no noisy outboards or Thai long tails here; it’s so peaceful. 048 05.182E in 8 metres of water. 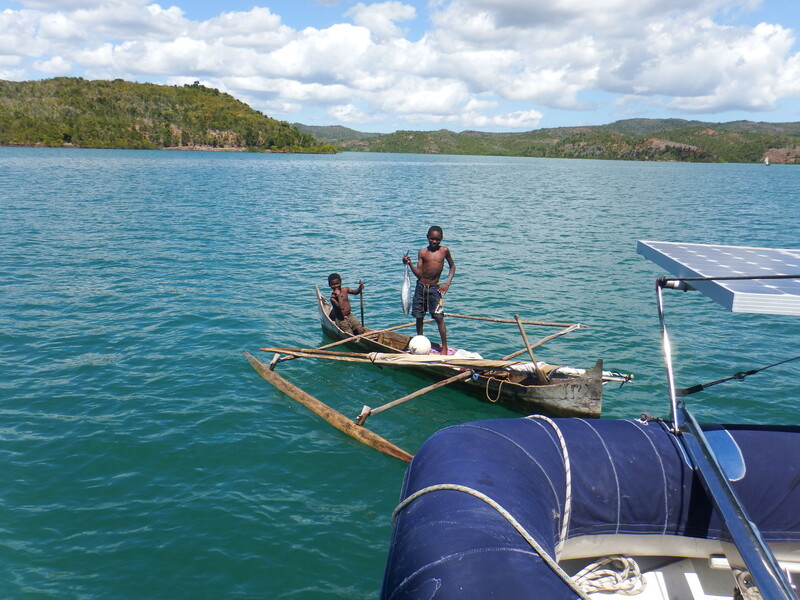 Within minutes of putting the anchor down these little chaps sailed over to us from the village. I just want to point out we’ve never been worried about these situations and have only ever encountered friendliness. They rolled their sail up and laid it across the outrigger before producing a fish for sale that was so stiff I dread to think how old it was. We thanked them kindly but refused it. They were asking for fishing line which we gave them along with some lollipops and they went away happy. The older one couldn’t have been much more than 9 or 10 and his brother was probably about 7. Adina arrived and we were invited over for a meal. It was a lovely evening. It enabled us to take some nice shots of Camomile in the evening light. The following day in the afternoon Camomile and Adina sailed across to Hellville ready for our Monday morning check in but that’s for another blog. Adina took some really good shots of Camomile on the way. 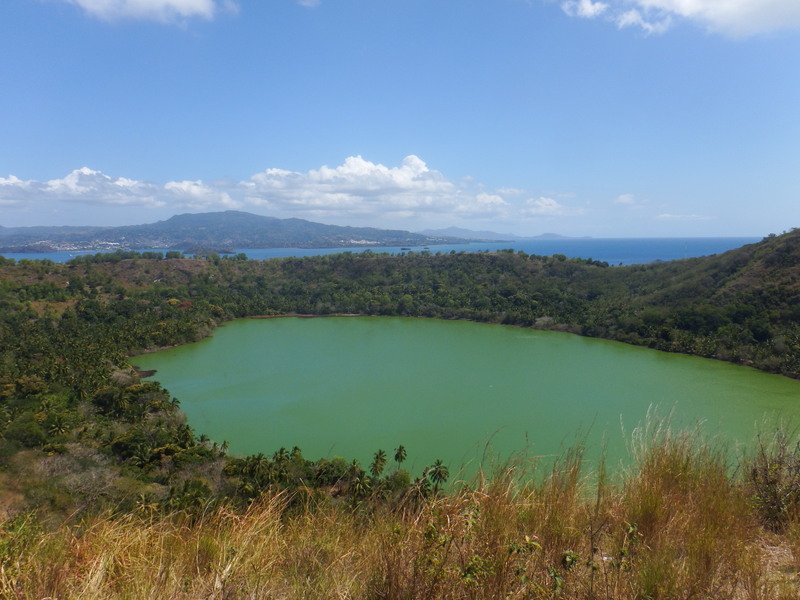 I’m writing to let you know we have arrived safely in Mayotte which is one of the Comoros islands off the east coast of Africa. It was a fairly uneventful passage with just a couple of bouncy bits. 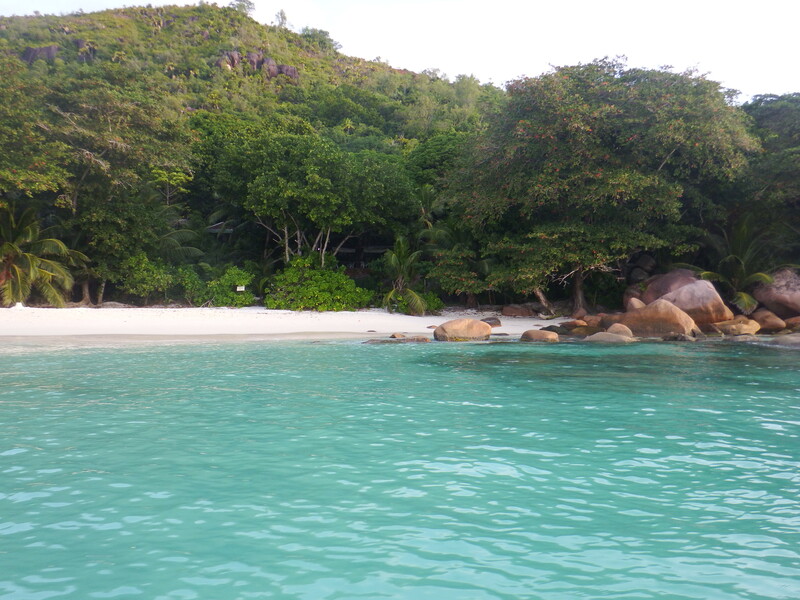 Last weekend Camomile and Tintin were anchored at Anse Lazio on Praslin, one of the islands off of the Seychelles, a truly beautiful spot, when we heard our friends on Adina had decided there was a weather window good enough to leave. 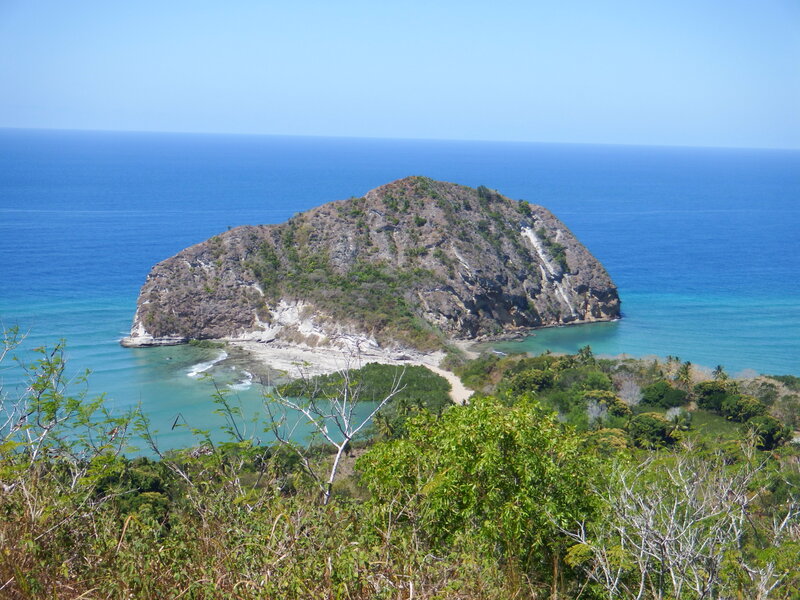 Both Bill and Kevin had been saying the weather was good to go but Jacqui and I were enjoying the island. After a little meeting consulting grib files and predict wind software it was agreed we should leave too. 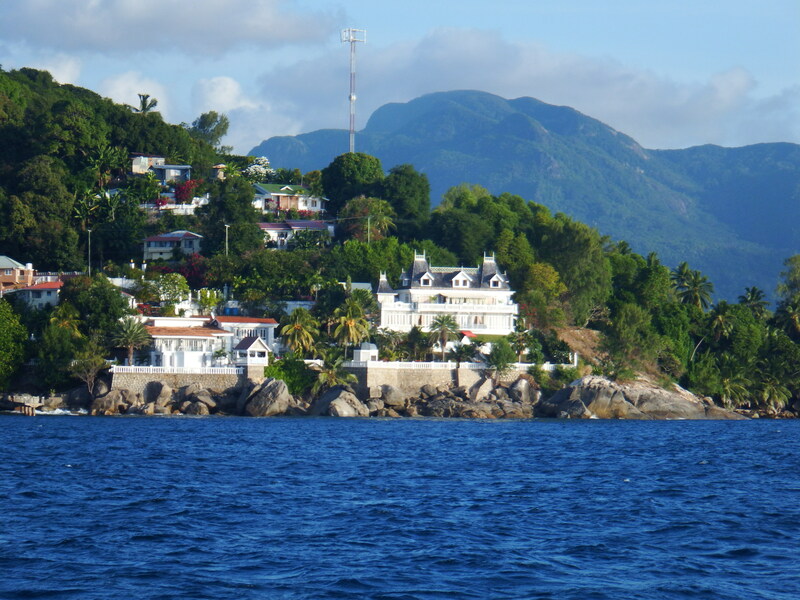 The passage from the Seychelles to Comoros/Madagascar has a bad reputation and it would be good to get it over as there did indeed look like a good weather window was coming up. 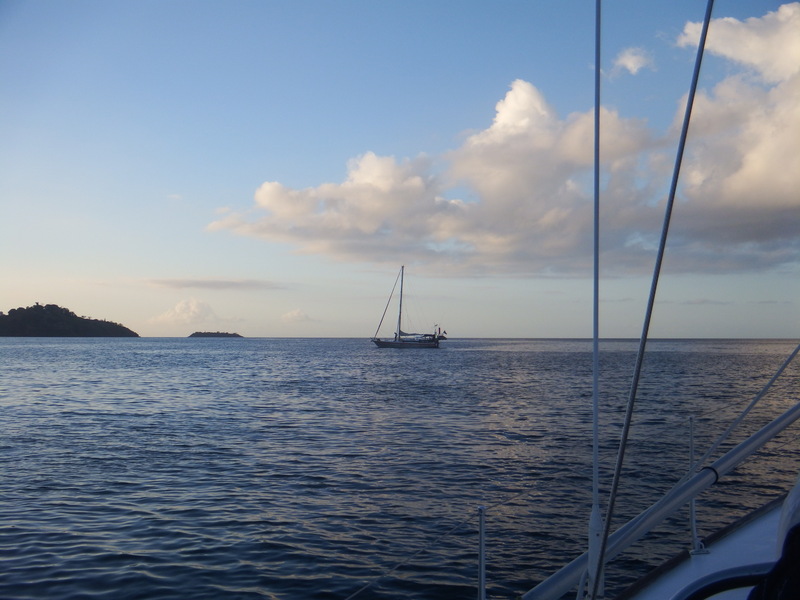 Wednesday 3rd August at 07.00 Camomile and Tintin weighed anchor and headed out of the bay. 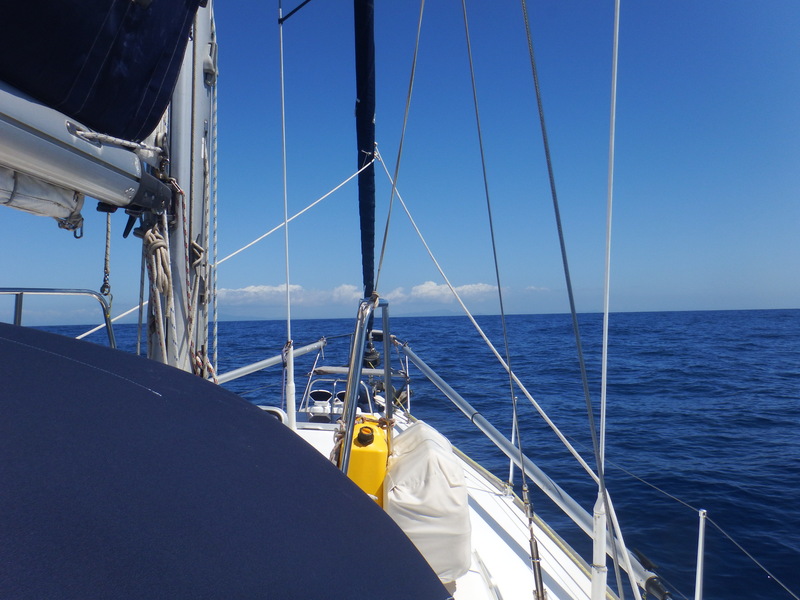 Within an hour the sails were up and we were sailing nicely in a light south easterly on the beam. We were traveling on the edge of the high risk area and this was as far north as we were going in the Indian ocean and the nearest to Muqdisho in Somalia. 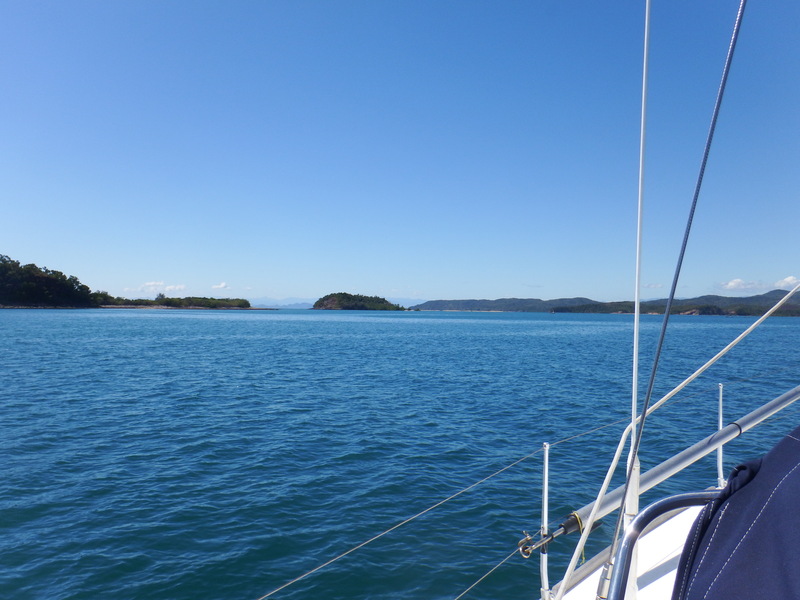 Hopefully the pirates have gone now but there was no point taking any unnecessary risks so it was decided we would only call on the vhf in emergencies and we also had our AIS (automatic identification system)on receive only. We had planned regular skeds on the SSB instead. The first day was uneventful. The wind stayed at a steady F4 on a beam reach so we made good progress. 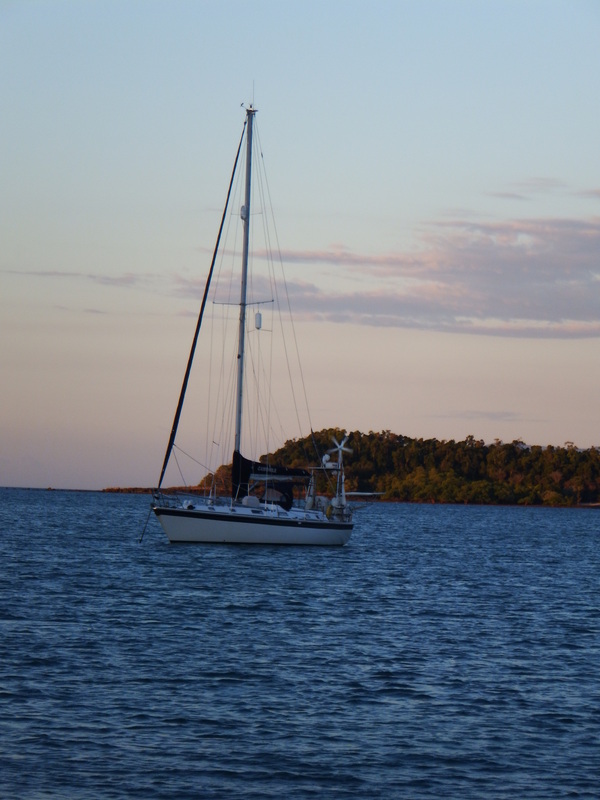 It was decided to put a reef in the mainsail overnight but it turned out to be unnecessary and it was shaken out the next morning. 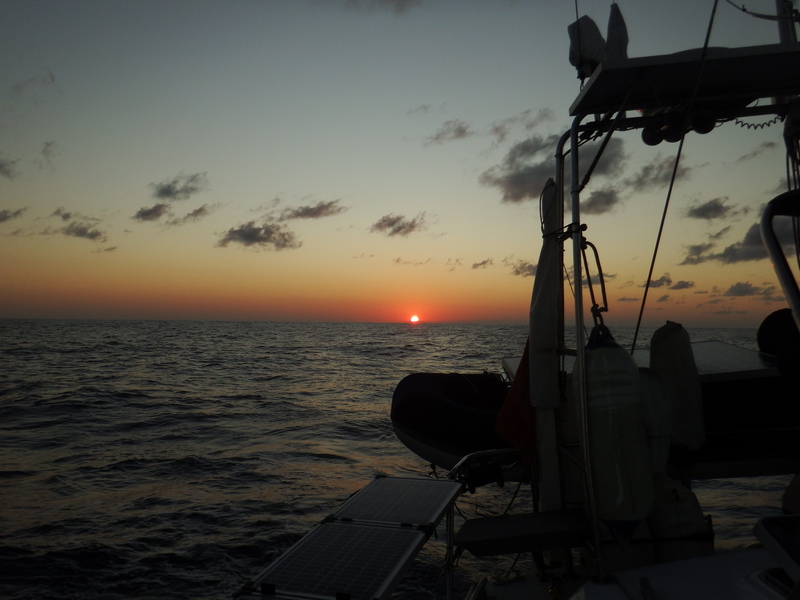 Our 24 hour run from 10.00 on the 3rd to 10.00 on the 4th was 166 miles – a lot better than the Chagos trip. 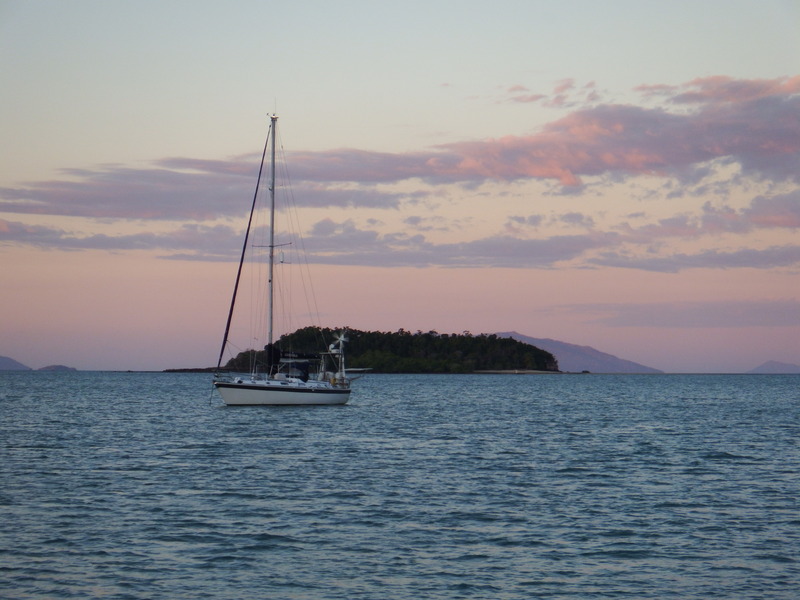 The wind dropped a bit on the 4th so we motor sailed for 2 hours to charge the batteries passing the Desroches islands on our starboard side. In the afternoon we passed over the Amirante trench with Alphonse island on our port. 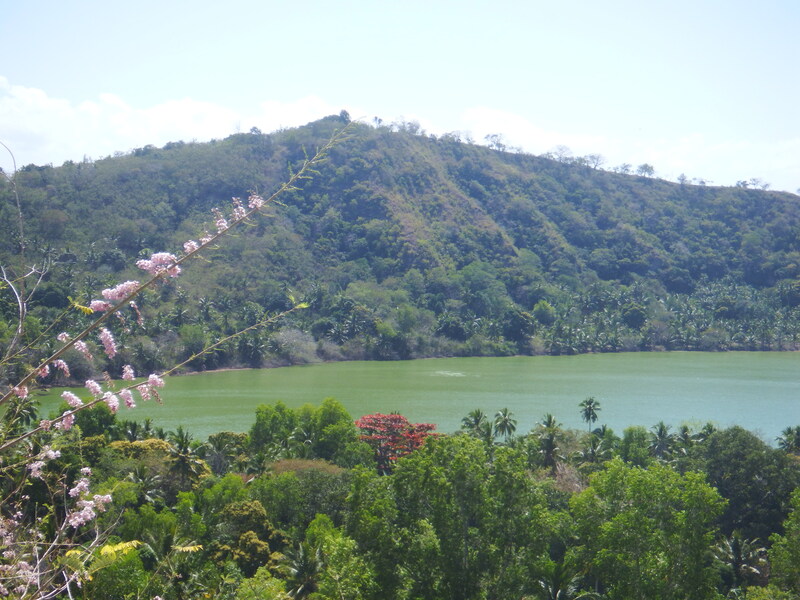 As this is the area the Chandlers were taken by pirates 7 or 8 years ago we kept a good look out. Our plan was to make as much south as we could before we turned to the west. We were trying to keep a course of 220 degrees but the wind got stronger overnight making things a bit bouncy but luckily no squalls. That night the wind had increased to F5 so we put a reef in the main when Bill came up on watch. 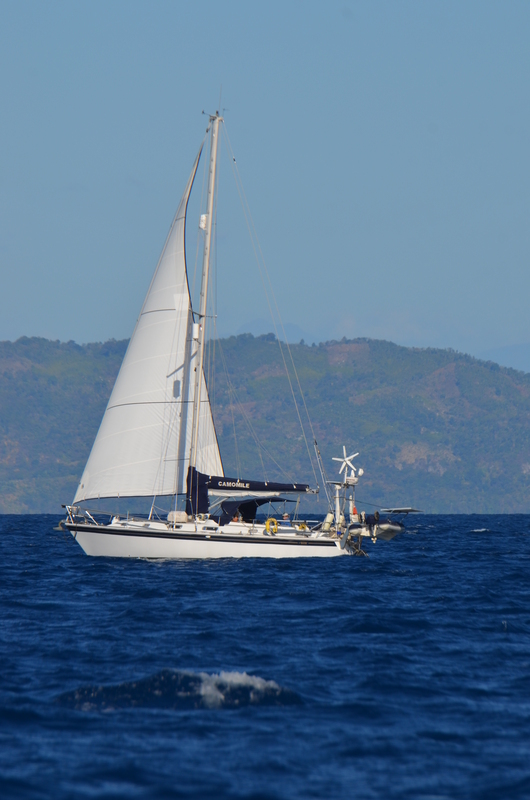 We had to crack off to starboard to reduce the slamming but tried to sail at 60 degrees apparent to maintain our southing. 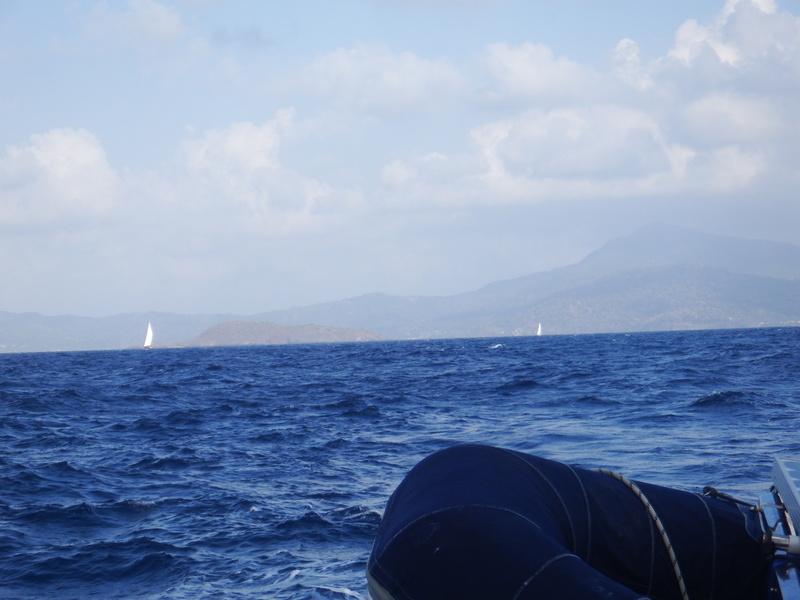 We were making really good speeds of 7kts and the next morning our 24 hour run was 155. There was probably at least a knot of current helping us along. 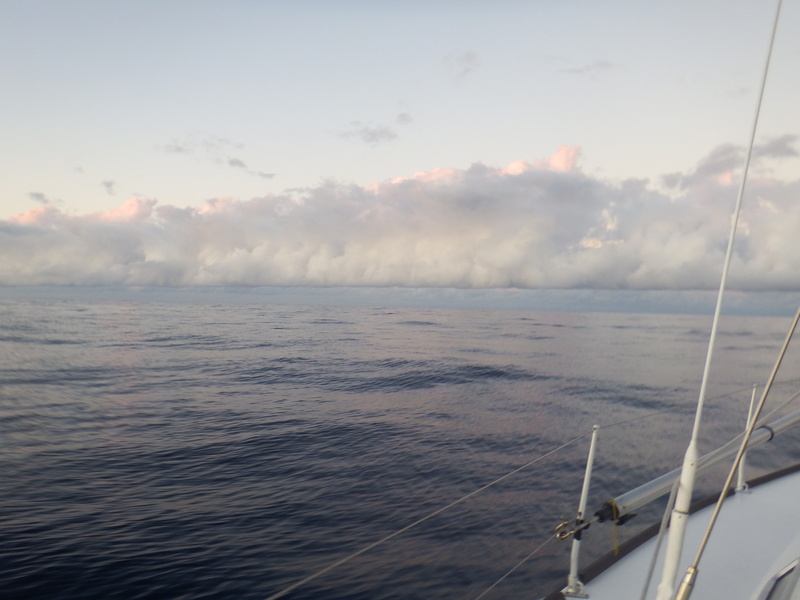 Still no squalls and no sign of the bad weather often reported on this passage. 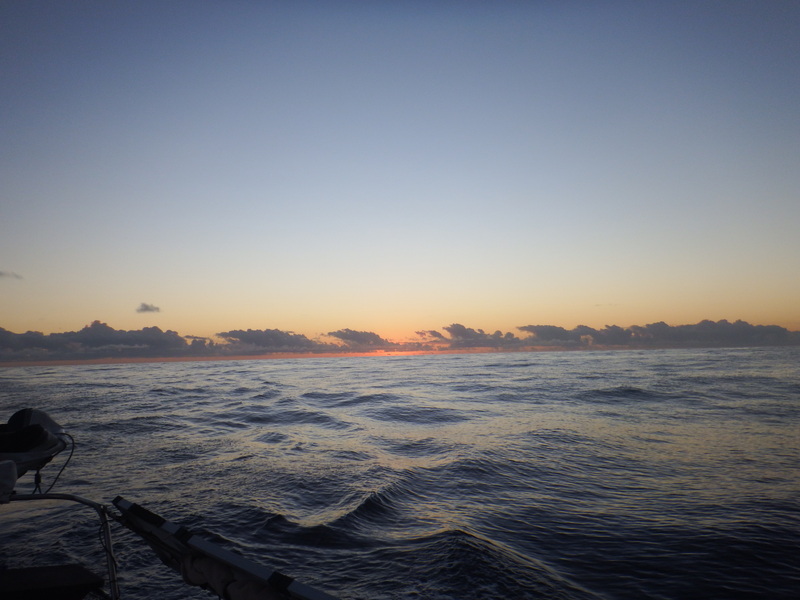 One of the joys of sailing are the sunrises, they never cease to amaze me. I spent the day reading my book ‘Me Before You’ by Jojo Moyes. I thoroughly recommend it but it has an emotional ending and I sat and sobbed for a full half hour at the end much to Bill’s amusement. The night of the 6th was going to be the difficult one. 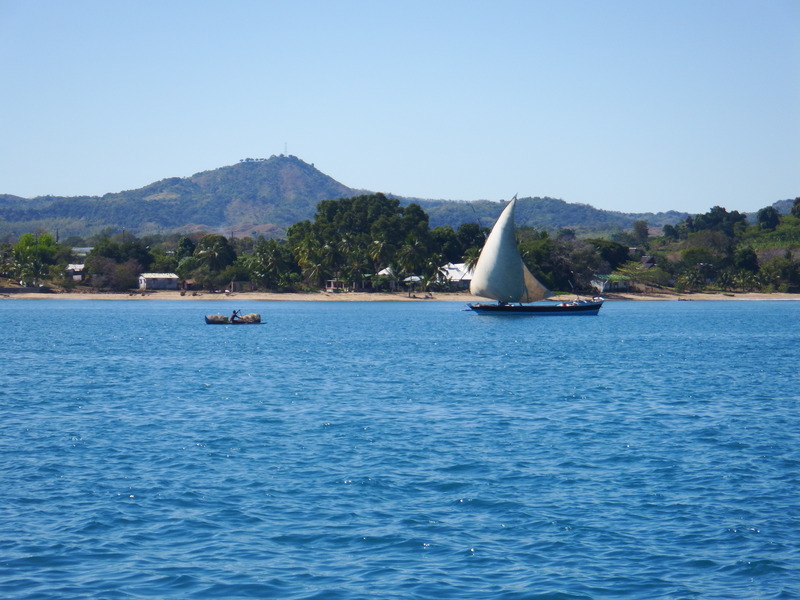 We were entering the compression zone of winds that come up from the south on the east side of Madagascar and was a notorious black spot. 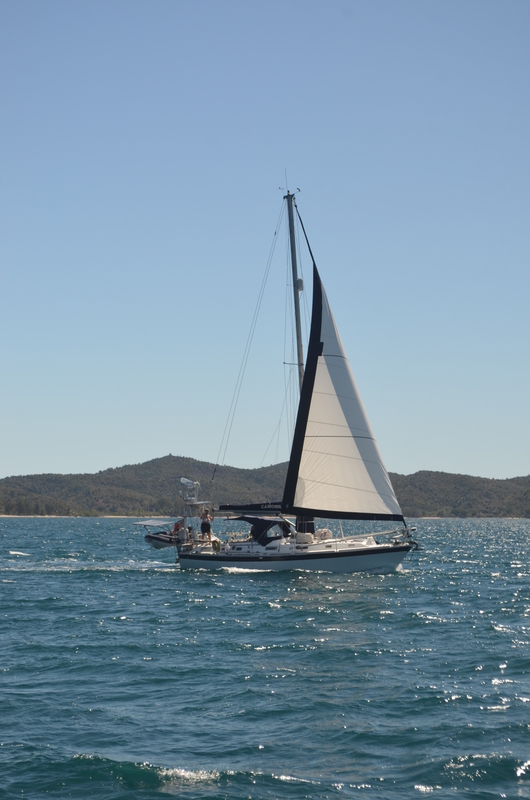 The forecast was giving 20kts but still from the south east so the plan was to continue on a course of 245 degrees. The bad weather, according to predict wind and the grib files, was due to start at 6pm. Sure enough at 18.30 we could feel the wind rising and the waves were getting shorter but steeper. 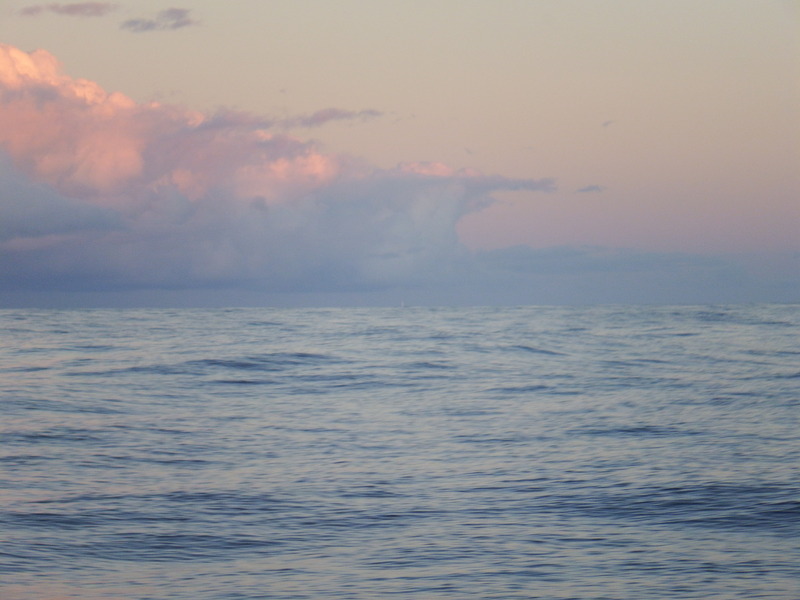 By 10pm we had a strong F6 with rough seas, it felt like being in a washing machine. The deck was covered in spray and several managed to find their way into the cockpit. It was forecast to last 12 hours and I kept repeating to my self ‘it will be gone by 6am, it will be gone by 6am’. Neither of us got much sleep that night although I spent a good bit of it cowering in my bed. (I know I shouldn’t be such a wuss but I’ve seen too many of these sessions and know what they can turn into! )By 2am we had gusts of 30kts but fortunately on our aft quarter. It dropped back down to 25kts after a couple of hours. Camomile loved it, we had 2 reefs in the main and a scrap of genny and she was still surging along at 7 – 8kts touching 9kts at times. During all this we had a stowaway. A blue footed boobie landed just after sunset and clung to the weather end of the dinghy all night. He had no intention of leaving even when a wave washed him onto the solar panel and off the other end. The stupid bird didn’t fly off but clattered back along the solar panel onto his perch and put his head back under his wing. 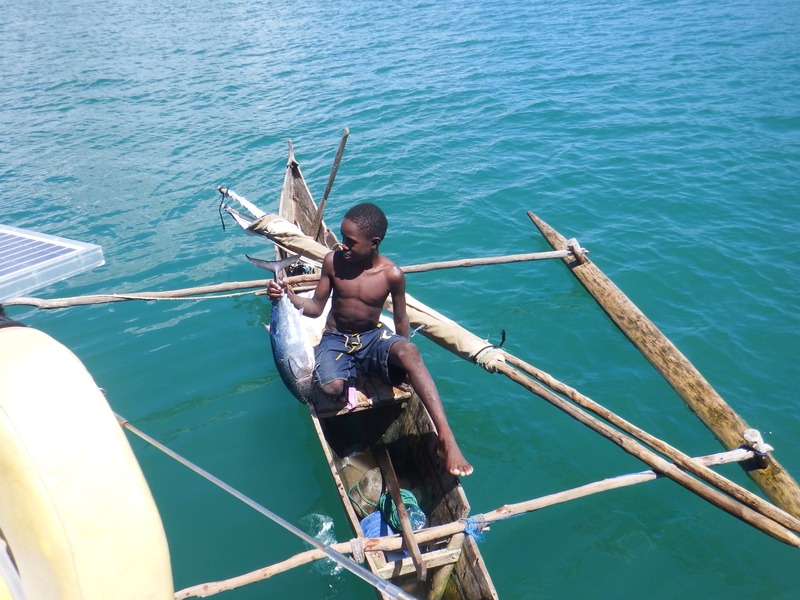 How he managed to hold on is a mystery but he seemed to move with the movement of the boat. In the morning at sunrise he stretched his wings, shook his head and took to the skies leaving a pile of crap on the dinghy and without his ‘takeaway’. When the sun rose I removed no less than 15 squid that had been washed onto the deck with the big seas, along with their horrible black ink, but you’ve got to love those boobies! That evening our trip log clicked over 50,000 miles since leaving the UK. It was also getting colder. We were now 11 degrees south and needed fleeces for the night watch and a blanket on the bed. The next morning just after sunrise I noticed this strange bank of cloud in front of us. I hadn’t seen anything like it before. It looked like there was a bank of cloud or fog below the normal clouds. Fortunately as we motored forward it dissipated. This was the edge of the cloud bank and if you look carefully you can see Tintin’s mast on the horizon. Life continued on Camomile that Monday morning. We were still motoring with the tide against us and our 24 hour run had been only 115 miles, we sail faster than we motor. Bill had some repair jobs to do. 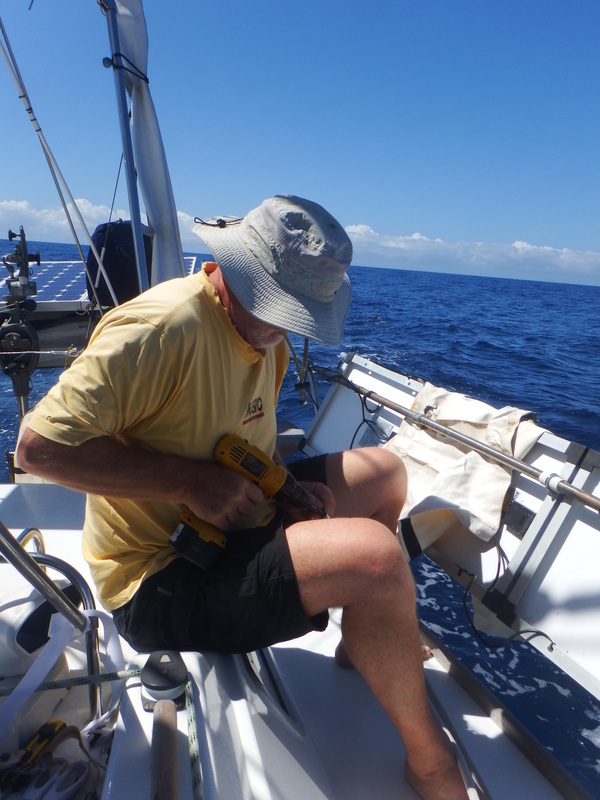 The solar panels had taken a bit of a bashing during the strong winds and Bill repaired the locking mechanism while we were underway. The bimini insert piece had come adrift but that was just the zip that needed re-threading which Bill did tooth by painstaking tooth. I started to clean up by washing down the cockpit and aft deck with fresh water. Everything was covered in a layer of salt. The water-maker was running most of the day to top up our tanks. 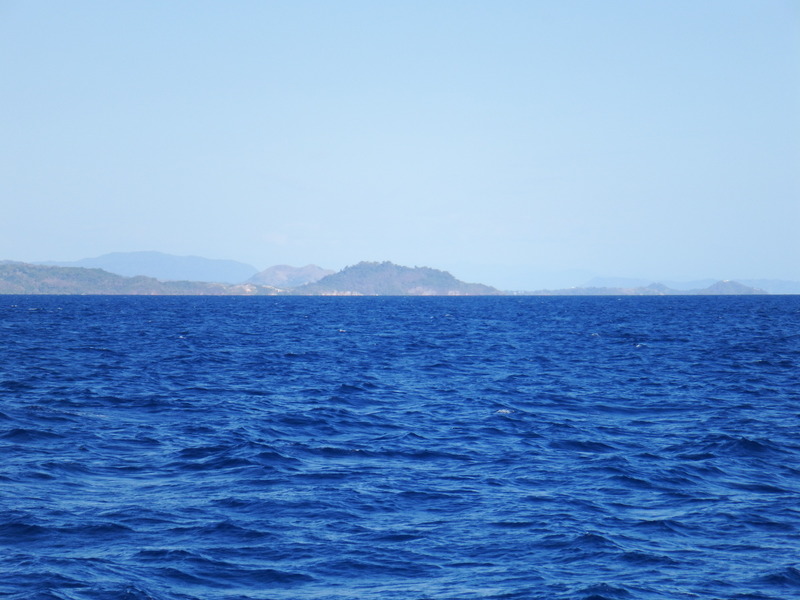 Land was sighted at midday, always a wonderful feeling to know the passage was nearly over. Tintin dropped their anchor within 10 minutes of us. Quite remarkable that the two boats had stayed so close to each other during the voyage. It was such a relief to get this passage out of the way. 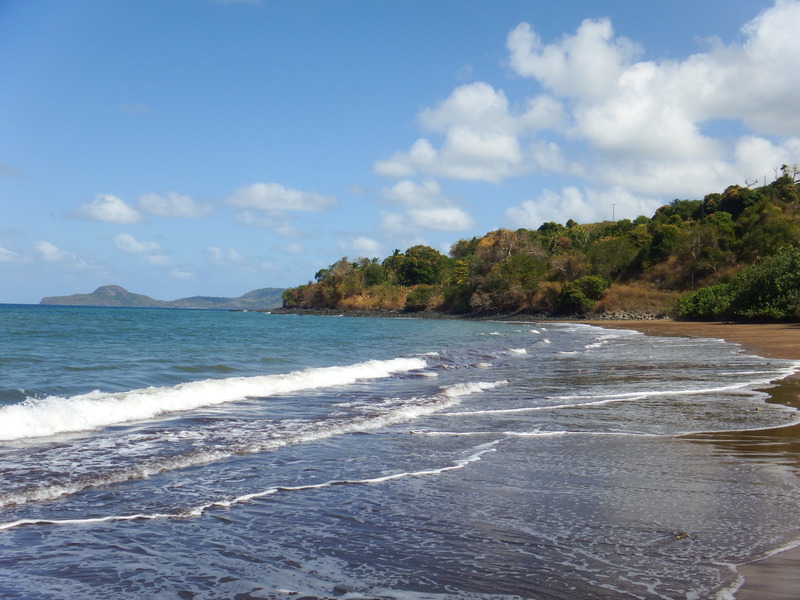 Tomorrow we would head south to check-in but just enjoyed the peaceful still of our first African island anchorage.